From the 30th of September until the 4th of October, Matty B brings to audiences the inspiring story of entrepreneur, Neville, in his comedy show Flanno Worries during the Sydney Fringe Comedy Festival. Matty B, also known as the Philosophical Bogan, returns for his second solo show Flanno Worries, and this is an interesting diversion from his pervious material. I caught Matty B’s stand-up comedy at the Friend In Hand and was very pleased to see his return for the Sydney Fringe Comedy Festival. I was also pleasantly surprised by his change in direction. Last time I saw him, I felt that the humour of his gags lay in the words and the delivery and that his strength lay in storytelling. See, Matty B is so eloquent and smooth with his language. He’s poetic and lyrical with his control and descriptions. Flanno Worries is just that, a story. Matty B has adopted the Aussie tradition of ripping yarns, and this comedy show is a creative reimagining of this oral tradition. He weaves a tale following the life of Neville, a man who falls into good fortune. We track Neville’s rises and falls, we sympathise with his constant bad luck, applaud him for his entrepreneurial genius and laugh at the errors of his ways. Accompanied by acoustic guitar, Matty B creates his own atmosphere and ambience while adding texture to the narrative. Matty B’s humour is very detailed and observant, his tone is undercutting, dry and cynical. He astutely draws attention to inherent flaws in the human experience. He uses visceral imagery to paint a vivid picture in the mind of the listener and he uses hilarious comparisons and allegories. It’s absurd at the best of times and offers a uniquely esoteric perspective. The content can be dark and gritty at times, so it’s definitely an adult night out. The Other Room at the Factory Theatre in Marrickville creates a very intimate space and is a great venue for this show. Matty B is an experience and I’m excited to see what he does next. 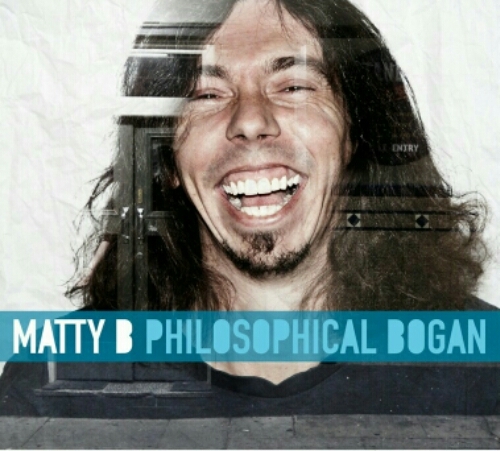 Thursday night saw the album launch of Matty B’s Philosophical Bogan, a stand up show of hilarious comedy coming from the renowned Matty B. The Friend in Hand, Glebe, was the perfect setting for a comedy set. I don’t often frequent the pub, so I wasn’t really aware of the Thursday routine that is A Mike In Hand- an opportunity for amateur stand up comedians to showcase their work. The Friend In Hand hotel is a quirky, offbeat pub steeped in old timey Australiana. It has the full regalia, such as mannequins in wet suits, a wall of car registration plates and complete with George, the resident Cockatoo. The Friend in Hand is a place of unique character, warmth and has an inherent sense of Australian dry, sarcastic humour anyway- so it only makes sense for the hotel to boast a live comedy night. The line up of comedians were great. For an amateur presentation, the presenters gave all they had- some presenting successful one-liners bam, one after the other, others from an international stage with reflections on travel and Australia. The most memorable comedians managed to dish out representations of modern society with uncanny accuracy and hilarious logic. These esoteric outlooks on life left the audience massaging their cheeks from laughing too hard. The headline act, Matty B, served his unique perspectives on life with the side dishes of dry, black humour and fragmented existentialism. His act was aptly named Philosophical Bogan and I highly recommend his act to anyone interested in stand up comedy. His humour is based in reality with real life experiences as he astutely draws attention to their inherent flaws and mocks them with dry comic timing. At other times, his experiences are so unique and esoteric that you can’t help but laugh at the level of ridiculity and outrageousness in each situation. A great night out, I recommend both A Mike In Hand and Matty B to all.